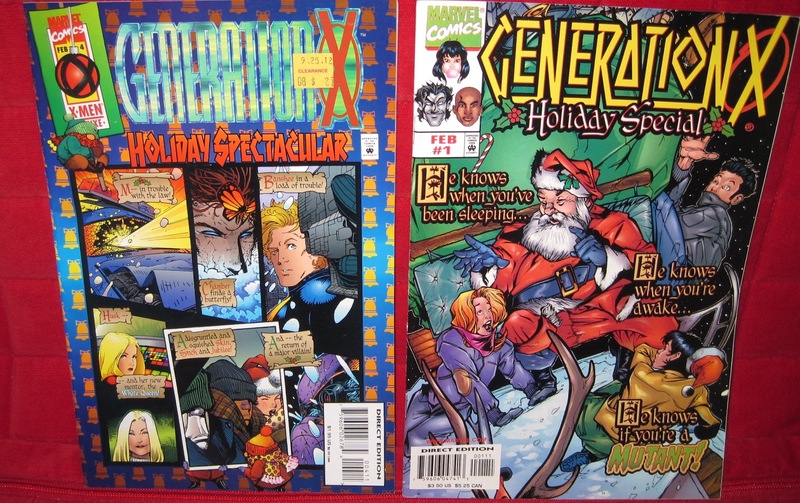 This little story about Generation X (Generation X is a team of teenage X-men, mostly second and third stringers I don’t know much about) intervening in a hostage situation in a Maine town isn’t terribly holiday related except for the snow. And the fact that the narration seems to be done by an elf hiding around the edges of the panels. That doesn’t have any bearing on the story, though. It’s okay, I guess, although the little snippets of characters unconnected to the story are more interesting than the story itself, and the villain seems awfully annoying. Joseph Harris, Adam Pollina, et.al. The same super-lame villains strike again, this time trying to kidnap a kid on Christmas Eve who’s only wish for Santa is to not be a mutant. The art is stronger in this one, and there’s some interesting snippets of character stuff early on when all the young mutants are shopping at the mall. 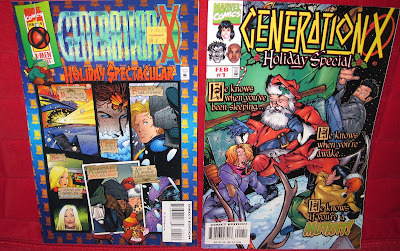 Then some of GenX gets captured, and the mutant kid holds Santa prisoner, and the villains keep screwing up... it’s occasionally amusing, but kind of a mess. Neither of these are especially recommended unless you’re a super-big fan of these characters. Jubilee does get a few good scenes, though. Hey, a new holiday comic! I picked this up at my local comic shop last week. It's a pretty cute little tale of blackmail and Robot Santa, but it's not great, just fine. 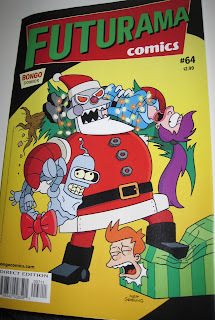 There was one part that really threw me, since I thought it showed a fundamental misunderstanding of Futurama, but Erin tells me that the show was inconsistent on the point. It still marred the experience of reading it for me.